Sometimes, the perfect ending to a meal is a light and refreshing fruit dessert. Whether you serve up an herb-infused sorbet or all-natural fruit ice cream, a lightly sweet dish can be just the thing to finish a dinner with flair and flavor. The Oster® Heritage Blend™ 1000 Whirlwind™ Blender makes creating refreshing and sophisticated fruit desserts easier than ever before, thanks to its innovative multi-point blade system that ensures smooth, consistent results and makes frustrating jar-jams a thing of the past. Strawberry sorbet gets a chic makeover with the infusion of fresh mint. The Oster® Heritage Blend™ 1000 Whirlwind™ Blender powerfully cuts through ice to create this restaurant-quality sorbet that takes just minutes to prepare. 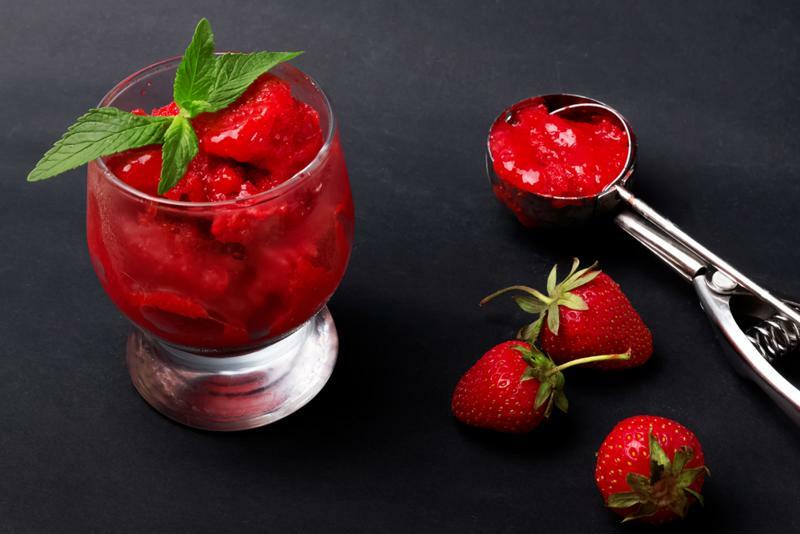 Add frozen strawberries, basil, ice and water to the Oster® Heritage Blend™ 1000 Whirlwind™ Blender. Begin blending, adding extra water if necessary. Once the ice is fully crushed and smooth, scoop sorbet into small bowls and serve. Cap off a meal with a light and refreshing strawberry sorbet. End your meal with some sunshine with this tasty and all-natural peach ice cream. An oat and brown sugar topping adds a sweet touch to this dessert while still keeping things light. In the Oster® Heritage Blend™ 1000 Whirlwind™ Blender, blend together the peach slices, honey and milk until smooth and creamy. In a small bowl, combine the oats and brown sugar. Scoop peach ice cream into bowls, sprinkle with oats and brown sugar topping and serve. A light, whipped cream cheese fruit dip makes for a fun, unexpected and light dessert. Pair with fresh strawberries, pineapple, kiwi, bananas and raspberries for dipping. Add all ingredients to the Oster® Heritage Blend™ 1000 Whirlwind™ Blender. Blend until whipped and serve with fresh fruit for dipping. For an ultra-light and refreshing dessert that tastes as good as it looks, make these pretty lemon cucumber ice pops. Blend the mix first in your Oster® Heritage Blend™ 1000 Whirlwind™ Blender, then pour into an ice pop tray and freeze. Add all ingredients to the Oster® Heritage Blend™ 1000 Whirlwind™ Blender. Blend until combined, then pour mixture into ice pop trays, attach sticks, and freeze until firm, about 2-3 hours, before serving.